A high-speed chase in Northwest Lamar County resulted with the arrest of a man on a felony charge of evading with a motorcycle and additional misdemeanor charges. 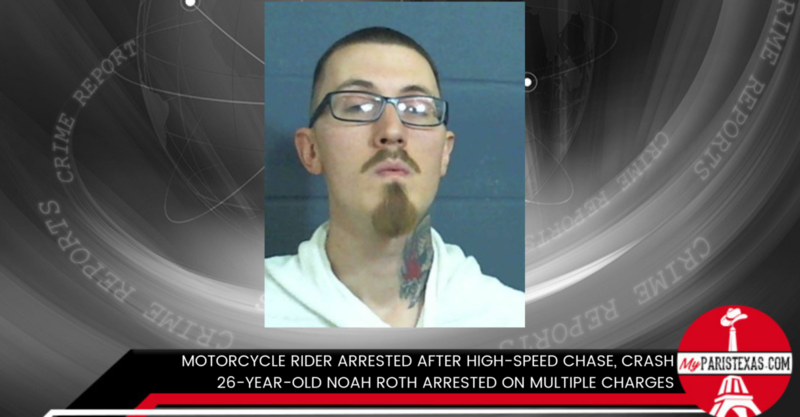 The driver, 26-year-old Noah Roth, failed to stop after making a U-turn at a local business and heading back toward the Tiger Town Community. “Speeds once again reached over 100 mph, before the motorcycle came to a stop just prior to FM 38 and FM 2352 intersection, where the driver and motorcycle ended up in the ditch,” said Hill.